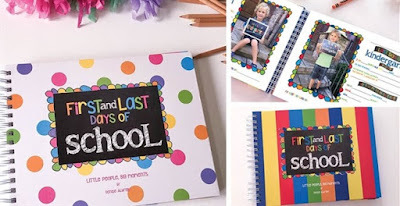 One Momma Saving Money: Easiest School Days Memory Book - Was $34.95 - Ships for $22.48! Easiest School Days Memory Book - Was $34.95 - Ships for $22.48! Shipping: $3.99 for the first item and $1.99 for each additional item. US only. Estimated to ship by Saturday, Aug 5. The First & Last days of school are big deals in a little person's life so this product helps you commemorate each event, easily! This hard cover, spiral bound binder is as turn-key as can be, yet captures so many memories with ease. Things like their handwritten name over the years, their class photo, and perfectly-sized quote bubbles for loved ones to share words of wisdom about the upcoming year! Each year, the pages are populated with questions for your child to answer...and many of those answers you'll cherish for a lifetime. Answers phrases like, "If I had $100, I would..." and "When I grow up, I want to be a..."
Each grade begins with a "Words of Wisdom" page with just the right amount of space for several loved ones to write a special note, including one address to "Dear Me!" Each grade spread includes a frame for a photo (or illustration), a place to write their name and all kinds of things about themselves...lots of great questions with short answers to download their precious thoughts they think! Actual size: 11" x 8.5"